Opening week in the Northeast has been interesting. Hunters are encountering decent hunting conditions. Weather has been dry and warm; birds have been pretty vocal in certain areas. I have spoken with hunters from New York, Pennsylvania, and Connecticut. All things seem good in the Turkey Woods of the Northeast. Opening day in Northern NY brought warm temps and hot birds! My hunting partner and I both had success after our roost set up. My hunting partner connected on a nice tom at 7:45. Light yelping mixed with clucks and purrs brought the tom, jake, and hen running. Hens were very aggressive on opening day. Gobblers stayed vocal and hens aggressive up in the morning. We set up on a few different groups of birds before I was able to seal the deal. Poor set ups were our down fall until getting between two groups of gobbling birds. Aggressive calling shortly before noon brought the two groups of gobblers into view and I took out the strutter! Birds stayed vocal and responding to calls in the next couple days with action slowly declining. 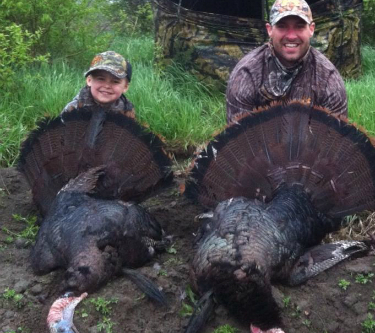 Hunters were still finding success throughout the state of NY in different areas. It has been reported in the Central Part of NY that birds aren’t as fired up as in the Northern part of the state. Overall NY is looking good this spring. Birds are still vocal and hunters are finding gobblers running together with small groups of hens. Hunters have also been seeing a good amount of lone hens, hopefully they are nesting. Birds seem to be responding oddly to decoys, if you are a hunter that uses them, try a single hen. Some reports have stated birds shying away from anything including a male decoy. Dwayne has reported that birds have been gobbling great during the opening week of their season. He stated that if hunters can find areas with low hunting pressure the birds are continuing to gobble up in the morning. Overall he said success rates seem up for this part of the season compared to previous seasons. As in NY hunters are seeing lone hens nesting which is really helping find a workable bird. Weather has been awesome as other parts of the Northeast have reported. Daryl has reported that toms have been very vocal from the roost as well as on the ground. He stated that birds were responding to call, but once they got into range of seeing the decoys tended to shy away. Daryl said the birds really didn’t seem to care for the sets that included a jake. Multiple hunts have proved that toms aren’t in the “competitive mood” with multiple long beards responding and coming to calls only to leave when seeing the decoys. Hunters in some areas of NY have reported similar behavior involving decoys. Daryl said single hen sets have been drawing aggression from other hens, which in turn could draw in a long beard. Currently the Northeast is yielding some great hunting and it looks as if it is going to continue and even get better. In some areas there seem to be great numbers of birds. Opportunity is abound in the Northeast and I hope that this hunting report can help you fill your tags. I look forwards to keeping the WTR followers updated as the Northeast season progresses! Shoot em’ in the face!